Projected FY loss is more than three times higher than the amount forecast in July. Kawasaki Kisen Kaisha Ltd (K Line) reports that it has revised its financial results forecast for the first half of the year (April to September 2018) and the full year (April 2018 to March 2019). The Japanese shipper said the forecast had been revised due to the expected negative impact of recent increases in the price of bunker fuel, in addition to a decrease in operational productivity and the impact from Ocean Network Express Holdings, Ltd. (ONE) - a company jointly owned by K Line with Mitsui O.S.K. Lines (MOL) and Nippon Yusen Kaisha (NYK Line). 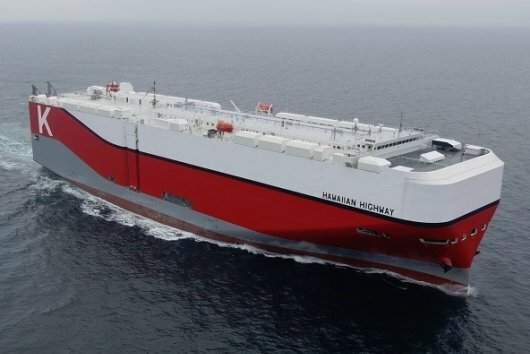 K Line now expects to post a H1 loss of JPY 26,500m ($236.5m) instead of the JPY 15,000m ($133.9m) previously forecast at the end of July - a 43.4 percent increase. And the full year prediction is now more than three times higher than two-and-a-half months ago at JPY 21,000m ($187.4m), up from JPY 7,000m ($62.5m). The average bunker price K Line paid during the first fiscal quarter (Q1), which runs between April and June, rose year-on-year (YoY) by $88, or 27.0 percent, to $414 per metric tonne. As a result, K Line revised its Q2 bunker price forecast in July upwards to $468 per tonne, and upped its H1 prediction to $441 per tonne, from its $376 projected price in April. The H2 forecast in July was $91 higher than in April at $460 per tonne; whilst the full-year average estimate was adjusted to $451 per tonne - $78 more than the previous forecast. As previously reported, ONE revised its full-year average bunker price forecast on Tuesday to $451 per tonne, which is $3 lower than July's price prediction. And for H1, the revised average bunker price is $6 lower than July at $434 per tonne.